The matriarch leads her herd to water. Some of my best sightings of wildlife have happened when it was least expected or there was a severe shortage of time. Here’s one such incident. 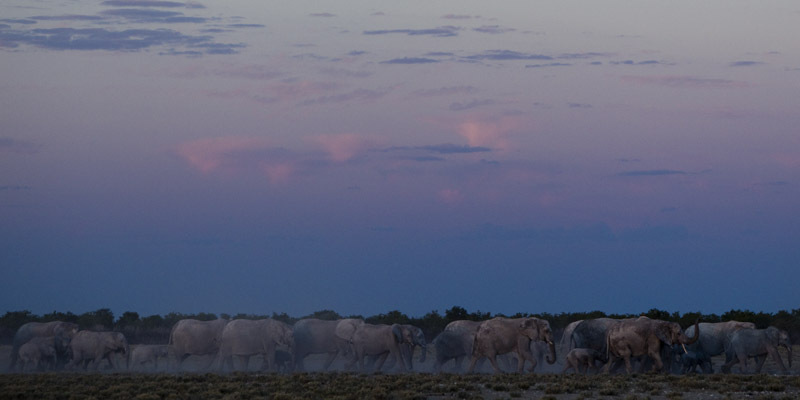 A bunch of researchers and I were driving back to camp one evening near the Gemsbokvlakte (Gemsbok Flats in Afrikaans) area of the Etosha National Park. The park gates would be open for another ten minutes or so and we would make it just in time if we didn’t stop anywhere. As we drove along the bumpy road, a distant dust cloud caught my eye. I strained to identify the cause as the cloud had direction, as if it was being caused by a fast moving animal. My instinct was to slow down to concentrate on the dust, and that helped me identify the distinctive shape and movement of the elephants. 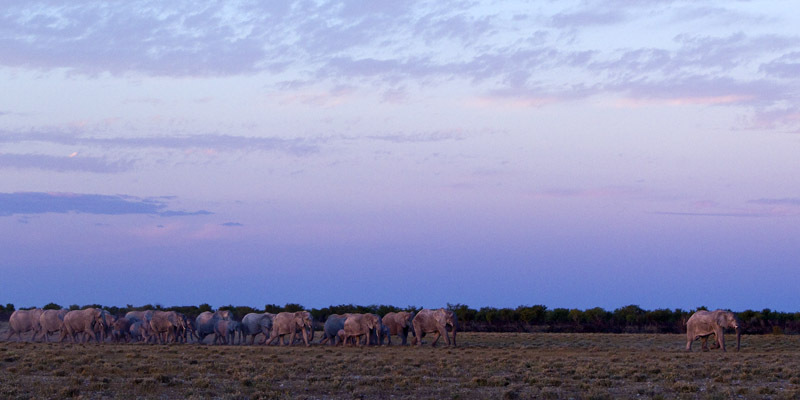 The late evening light had blended the pachyderms perfectly into the rows of trees in the background. Only the dust they kicked up was catching the remnant sunlight to give them away. I usually don’t see elephants in this part of the park and certainly not big matriarchal herds. As I stopped the car, I was met with protests regarding time as no one else had seen the elephants! I pointed out the elephants with excitement, but they thought I was making up stories as the animals were quite far from the road and I had the fortune of catching the dust before it disappeared. After much persuasion they were finally able to see what I was seeing. It was a large herd of perhaps thirty or more, and a very unusual sight for us in the short grass plains. I thought that the light was great and had a cool dreamy feel to it. The elephants were moving in our direction, as we were close to the waterhole that was their destination, and when there are lots of young calves in a herd there’s never a dull moment when watching them in water. There would be some nice sights and perhaps some nice photographs. However, I was aware of the fact that we were short on time. They were still about five minutes away from water and there was no way I could stay and see them. I have never broken a rule in the park, and if there was one time that I was most tempted to do so then it was that day. I actually asked the researchers how much they would fine me if I drove in a few minutes late as I thought that that money was worth the extra time I could get with the elephants. However, as soon as I asked I realized that the cost of breaking a rule was more than just its monetary value. I didn’t want to be known as a rule-breaker. No way. I still could make it to the gate within a minute or two of the closing time, but I had to leave immediately. I quietly put my camera away and started to drive. For minutes afterwards I was regretting my decision and was tempted to turn around, but I had to respect the rules in the park that I love so much. In the end, that was the right decision and I must say that I’m very happy with myself for having overcome that temptation. Elephants kicking up dust as they walk briskly towards water.